Spyro Reignited review: "A joyous trip down memory lane well worth taking"
Spyro Reignited may not be as true to your memories of the PS1 trilogy as you'd like, but it holds up well and hasn't let go of its unique, kid-friendly charm. Spyro the Dragon was the first game I ever bought with my own money. After months of doing chores around the farm to earn a bit of scrap, I remember gleefully directing a Toys R Us employee to the game, holding it firmly in my hands all the way to the counter, and thumbing over the manual on the ride home. This purple dragon meant a lot to me growing up, and I hold those memories close to my heart. Spyro Reignited is a 3-in-1 remake and repackaging of the original Spyro trilogy, a chance to relive those special times and revisit an old friend. But would I feel welcomed and embraced, the pain of nostalgia giving way to warmth and childhood joy, or would the rose-tinted goggles looking into the past be shattered as I picked apart every little difference and decreed, "This isn't my Spyro"? The answer: a lot of column A, a little of column B. In a sense, the Spyro Reignited Trilogy is a game (or games, depending on how you look at it) caught between eras. Spyro the Dragon, Spyro 2: Ripto's Rage, and Spyro: Year of the Dragon all came out between the years of 1998 and 2000. Two decades later, there are certain things players expect from a 3D platformer that weren't yet enshrined into game design law when the Spyro trilogy first came to market. Things like: being able to directly control the camera. Yeah. Go back and play the first Spyro. It's easy to forget this beloved game didn't allow you to aim with the right analog stick, a feature we now take for granted. 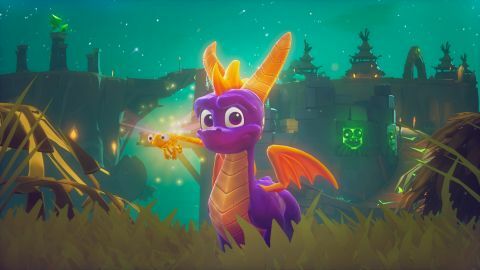 The challenge for Spyro Reignited, then, is to straddle the line between providing quality-of-life improvements modern players expect while working around gameplay that's 18+ years old. Juggling nostalgic fondness and contemporary sensibilities is a difficult task, but Reignited succeeds. Considering my history with the franchise, you can imagine the fear that came washing over me when I started playing Spyro Reignited and saw a message pop up telling me I'd earned a new skill point. Skill points?! Not in my 1998 platformer, thank you very much! But as it turns out, my fears were unfounded. The skill point was more of an in-game mark of achievement for discovering difficult-to-reach areas, completing challenges, or uncovering easter eggs. And once I knew that, I actually appreciated the new system; it gave me, someone who could probably 100% the original game with their eyes closed, a new way to enjoy Spyro's adventures. The aforementioned ability to control the camera is a welcome touch, of course. There's also a guide book that lets you track your progress through each game and level means no need to jot down how many dragons, eggs, or gems you've yet to collect. The gem finder feature, originally only available in Year of the Dragon, can now be used across all games to help completionists find any pieces of treasure that elude them. Not every change is a welcome one. In ye olden days, holding the charge and jump buttons simultaneously caused Spyro to do a sort of gallop, which was particularly useful in climbing hills since each time Spyro came down from a gallop he'd immediately jump (meaning more jumps while going uphill), and each jump gave our purple hero a tiny burst of speed. This technique no longer works in Reignited. The character of Spyro's world also feels changed, but definitely for the better. With the PlayStation 1's limited capabilities, many details in Spyro's world had to be simple. Gnorcs and Rhynocs, two of Spyro's most common enemies, were largely-featureless blobs of one or two colors in the original trilogy, but here they're rendered in exquisite detail, full of warts and bumps and tusks and bulging bellies. Spyro's dragon friends were likewise constructed from largely recycled models, while in Reignited I'm not sure I ever saw a duplicate. Each dragon also has distinctive features befitting their respective worlds: artisans carry hammers, paintbrushes, and other crafting tools, peacekeepers are decked out in armor and look tougher than any other variant, magic crafters are strange and exotic, like scaled fortune tellers, and so on. Other friendly races (seen in Spyro 2 and 3) have likewise been given overhauls. Spyro himself has also been given a burst of personality. Where before he was more or less restrained to raising or lowering an eyebrow to emote, here he shows his fangs when he smiles, puffs out his chest, slithers and snakes, and is generally just a joy to watch. On the one hand, these visual upgrades are unquestionably better, but they might not conform to how your childhood mind filled in the gaps. Before picking up this remaster, you should ask yourself: how well do I handle change? The Spyro Reignited Trilogy is 95% the games as you remember them, but how you deal with the remaining 5% of change is going to determine how you feel about the package as a whole. Sometimes, that 5% is a welcome surprise. Sometimes it feels like a major bump in the road. Simply put, these games aren't always going to line up with how you remember them. Not quite. This is all well and good for those who are wanting to retread familiar ground, but what can those wanting to try the series for the first time expect? First, be aware that the Spyro games are not exactly challenging. If an enemy is wearing armor, charge it with your horns. If it's tall, hit it with your flames. Combat really doesn't get much more complicated than that. As for the gameplay itself, the original Spyro the Dragon was a 3D platformer nestled somewhere between the pure focus of skillful jumping a la Super Mario 64 and the obsessive collectathon objectives of Banjo Kazooie. You'll visit several hub worlds, each with a collection of smaller levels themed around specific challenges like shapeshifting fairies or deadly bullfrogs. Spyro 2 and Year of the Dragon are... well, basically that, but with NPCs to talk to. Sometimes these NPCs will just give you some tips or add to the world building, other times they'll be your source for mini-game challenges like skateboarding or ice hockey. Remember too that these games came from a time when the idea of a game world that spanned miles was laughable. Each game's levels take mere minutes to complete, and it's only when you opt to hunt down every gem and collectible, complete every skill challenge, or try for the highest score in every mini-game that you'll spend a significant amount of time in them. Level design is rarely difficult to wrap your head or thumbs around, and Spyro feels just a bit less twitchy and easier to control in Reignited than he did on PS1. I can't quite put my finger on why that is (seriously, I popped in all of the original games to compare and I couldn't chalk my feelings up to anything observable) but it should result in fewer cheap deaths or feeling frustrated by inaccuracy. Stewart Copeland's fantastic score also helps keep the mood chill. Catchy, relaxing synth melodies and simple drum beats gives everything a quasi-jazz, quasi-prog rock vibe, and the fact players can swap between original or "reignited" forms at any time is much appreciated. While the reignited versions are great and doesn't dishonor Spyro's legacy at all, there's something so charming about the simpler, old-school score. My experience with Spyro Reignited began with apprehension upon noticing that a thing I love has changed, followed by acceptance, followed by excitement to see where these new paths and features would lead. It was not always the journey I expected or remembered, but it's a joyous trip down memory lane well worth taking.